Podcast Episode 21 – Podcrash! We’ve been Podcrashed! After a brief hiatus, Preston and Patrick are back with Episode 21 of the Gameroom Junkies Podcast. 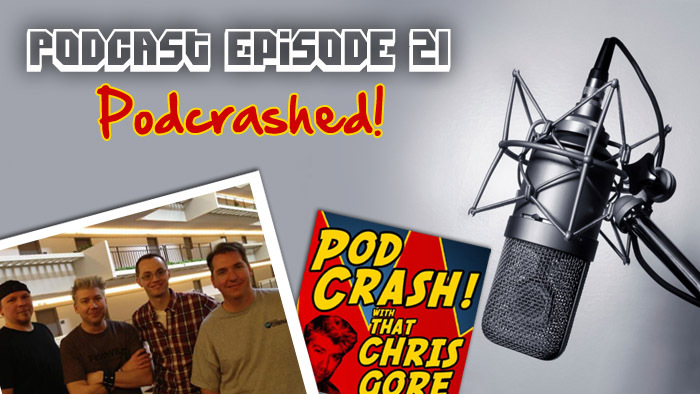 The highlight of this episode is being “crashed” by comedian and new media celebrity, Mr. Chris Gore. Recorded at DragonCon 2012, the conversation bobs and weaves between arcade games, movies about arcade games, and console games of yesteryear. In addition to their personal gameroom updates, the guys also discuss latest on Jersey Jack Pinball’s Wizard of Oz pinball and Preston gives his impressions of Stern’s X-Men Pinball. Finally, Patrick reluctantly participates in the return of the “Name that Game” segment featuring classic 80′s vids.